84% of Americans currently own a mobile phone. Sadly, there are no figures showing how many of these devices are ageing bricks without internet capabilities, but you can bet that, within a few years, the majority of mobile phone users will be able to browse the internet, wherever they are. Right now, most websites are completely unsuitable for mobile viewing, taking 60 or more seconds to load and looking jumbled and confused as they’re squashed onto smaller screens. MoFuse is one of the most popular mobile website builders around, which is unsurprising considering its excellent customizability. Visit the MoFuse website, click “Launch a New Mobile Site”, choose a mobile domain and insert your URL. Next, click on “Add Elements” to add dynamic and static content to each page. Click on “Layout” to transfer elements to your live site, dragging and dropping them to create the optimal visual arrangement before, finally, previewing your new site using MoFuse’s emulator, which brings up a mobile phone screen on your computer’s monitor. For bloggers, MoFuse is completely free and even easier to set up. Mippin is an absolutely fantastic tool for those who want to mobilize an RSS-driven site. It doesn’t offer the same level of customization as MoFuse, but it’s much quicker to use and the results look great, every time. What’s more, your site will be optimized to work on over 2,000 handsets and the service is completely free. It provides users with basic analytics in reports, as well as the ability to earn money through mobile advertising. Mobilize by Mippin is a terrific WordPress plugin, which automatically displays your blog to mobile visitors from your normal URL. Once installed, everybody accessing your site from a mobile phone will be automatically redirected to the mobile version. Photos are scaled to fit the horizontal dimensions of a phone screen and videos are converted to the 3GP format, commonly used on most 3G, 2G and even 4G phones. At last count, 31,912 websites had been optimized for mobile phones using Wirenode, a tool which lacks the customization potential of MoFuse, but offers slightly more in this regard than Mippin. From Wirenode’s dashboard, users can configure their domain name, upload pictures, track visitors and page views and preview their site on an emulated phone. Wirenode’s simple Editor interface lets users personalize their mobile site with colors and images, and create, edit, rearrange and delete individual pages. 2ergo has mobilized huge organizations like Rightmove and The National Guard, creating mobile-friendly websites for them which look great and load quickly. 2ergo’s customers can choose to use the self-service mobile publishing and content management tool, Mobile Site Builder, or let 2ergo design a custom site especially for them. The latter, obviously, is the more expensive option of the two. 2ergo’s service includes automatic device and carrier detection, data capture and collection forms, an integrated ad service platform, real-time tracking and top-notch technical support. Zinadoo is a really slick, free tool, which lets users build a mobile site quickly and easily. Users can make the most of Zinadoo’s web and mobile widgets, as well as its text and email services, to promote their site to an online and offline community. Furthermore, they can optimize their site for Google Mobile with keywords and tags, and upload videos using Zinadoo’s Mobile Video. As if that wasn’t enough, users can also gain access to Zinadoo’s online Business Directory and Mobiseer, a Web 2.0 service for organizing, tagging, sharing and managing favorite mobile sites. Winksite is an excellent W3C mobileOK and .mobi standards-compliant mobile website builder which focuses heavily on the community element of website promotion and social interaction. It’s packed full of mobile-community-type features like forums, chat and polls. Users can use Winksite to create their own mobile portal for communicating with friends, sharing feeds and favorites. Users can also divert all of their texts, emails and Twitter messages to one mobile destination which people can interact with. MobiSiteGalore offers a mobile website builder, which can be used just as easily from a mobile phone as a computer. Its Quick Start Wizard, accompanied throughout by Help Movies, makes setting up a mobile website incredibly easy. Once you’ve added pages, chosen a color scheme, added content and checked your new site for compliance with ready.mobi standards, you can add items to your new site from the Goodies List. Goodies include click-to-call, add to phone book, Google search and links to PayPal. You can’t build a mobile site using mobiReady. What you can do, however, is test your existing site for mobile usability. Enter your URL and press “Go” to get free reports, detailing how well your site displays on mobiles and any potential problem areas. You’re even given information regarding how much people in different parts of the world are charged to view your site. Google Mobile Optimizer is the quickest possible means of transforming your website into one suitable for mobile user consumption. Navigate your way to google.com/gwt/n, enter a site URL and a lightweight version will appear, without headers, ads or images. It’s completely un-customizable and renders a minority of websites useless, but it’s a very useful bookmark for your phone. No matter if you are interested in ccna or ccnp, get your networking credentials with testking and achieve guaranteed success on first attempt. Tom Walker is a blogger and design who works with an ecommerce store specialising in printer ink in the UK. As editor, he maintains their blog where he contributes posts about the arts, print media and advertising. Great list, one thing I don’t see is the WordPress Plugin, WP-Touch http://www.bravenewcode.com/products/wptouch/ it does iPhone/iPod Touch/Blackberry Bold & Android phones. I personally use Mobify – simple, free and easy to use. Great customer support too. Didn’t know about some of these, thanks for sharing. nice list, gonna be really useful to me, thx for sharing. Nice list, I haven’t heard of some of these before. Mobify is my favorite, but I’ll be checking all of these out. I personally use the WP Touch wordpress plugin. Simple, easy to use, and free. Thank you for the list. I can now refer people to this post when they ask me what tools they can use to create a mobile version of a website. This is a great list, but a bit confusing for a intellectually challenged person such as myself. What I couldn’t discern was which one of these is going to create a mobile site that will populate from the content I am already posting to my “regular” site? It seemed that they all required original content placement separate from the original, or non-mobile, site. Of course I may have totally read it wrong. Thanks so much for putting this list together. I was actually looking for something like this as I think the future will make us produce more and more mobile version websites. i think the big challenge for web designers is browsers compatibility than mobile compatibility, because for me creating well designed website compatible with all browser is harder than creating website for a mobile. but thank you for the list, it might be my future reference for creating mobile version of my website. Nice list..i was aware of to many services… i know mofuse because already wrote a review about him! its a really nice app. With this list i´m going to explore a bit more! what about others like netbiscuits.com offering an sdk for complex implementations and a great sitebuilder for compelling mobile websites (including POI locator, messaging, form templates, integration with 5+ ad networks, etc). check it out with their 30-days-trial version!! Nice list, I’ve tried a few of them but had most success with WAPPLE http://wapple.net/ nice and easy, easy to use console and I love their free WordPress architect as it was the most successful at retaining the look and feel of my blog and I can now manage the admin side of it too from my mobile. This is a great list, I was agonizing recently over the un-usability of many sites on mobile devices. Bookmarked and shared for future reference. We also developed http://www.osmobi.com ,a great free tool voor Drupal and Joomla! websites! Thank you. This is a great post just what I was looking for. thanks for posting this nice article, I never thought about how to make a mobile website! Also there is such service as MobilizeToday.com. This is soooooo useful! Thanks! I have been using MoFuse and it is really easy to use but there is a small charge. I have been using this since 2 years and still i haven’t got any problem with it, they provide all the possible service and information. Awesome list thank you. I used widgetbox.com to make one for my site today – Free!. Includes ad’s though… Otherwise super simple to set up. If you want to be current, you might want to update this list. noting that mobisitegalore is no longer a free SaaS, albeit, the pricing model isn’t that bad, but its not free anymore. Thanks this is a great list and something we all need. Our firm consults with small and medium sized businesses on their online presences. Aside from painstaking going in and recoding a site for mobile phones, I was not aware of these utilities to convert the site for you. I’ll be trying each of these out to see which one works best for our site and our clients sites. @Curt Moreno: Those of these that can utilize content pulled form an already published site seem only to accomplish it through RSS or ATOM feeds which is really not a good solution for the types of large CMS-driven sites my company typically works with. 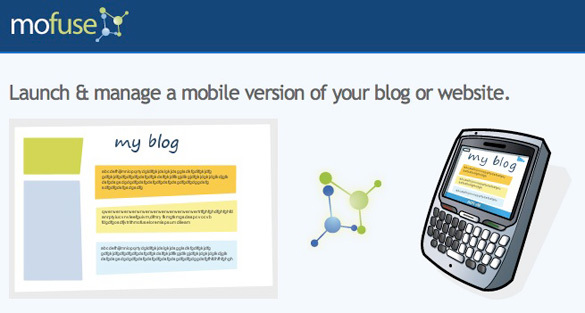 Mobify is great in that the content is pulled from your site, modified as you wish, and re-served to mobile devices. I’ve yet to find another service that provides anything similar. If you are looking for something like Google Mobilizer, but will actually serve content from you own site instead of Google’s, you might want to check out phpMobilizer. Just drop a few files into a subdomain and your site is automatically converted. Add one line to your php code if you want to auto-redirect for mobiles. I use UNITY Mobile to create all my mobile sites. It’s kind of like mofuse, only instead of lots and lots of forms UNITY Mobile has a mobile WYSIWYG editor which makes things very simple and easy to create profession mobile sites. There are a bunch of other services out there, but UNITY’s service alone is worth it. Does anyone know if a stand alone PC based software exists, I am looking to pay a one off fee in order to build multiple .mobi sites for clients sites. I do not want to be tied to any one company or a repeated monthly fee, also some of the free builders insist on having their links on the sites created which is no good for developers. Nothing is free and there is always a catch with the free services [ which I might add are superb for personal sites etc ]. If anyone comes across such a dedicated PC based software please can you post it here.. This is great, I’m glad I was able to find this post. Better late than never. It is indeed a great way to prepare ahead for the coming years. Nowadays, there were lot of website owners that have already mobile version of their sites. This is a great list for mobile web development. Great article. I didn’t know about ant of these. I did it the old fashioned way. Try some code, test it on several devices and try again until …..
Hey, please include us too! We make it super simple to create an attractive mobile site in just seconds. We focus on just showing the relevant data to your mobile users and let them experience your full site if they cant find what they need. you should include http://www.mobilova.com in the list, it’s one of the simplest and fastest yet reliable solution I came accross so far, if you are a a blogger, this your best way to go, you may also use some plugins if you are on wordpress, of course , it takes more time, and you need to be geeky. What I can’t figure out is how to get your squeeze and landing pages to work on mobile phones. If my website is http://www.website.com and one of my sales pages is http://www.website.com/salespage, how do I get the sales page to show up as my home page on a mobile phone? The Mippin style site with blog posts just doesn’t sell or build a list as well. I’ve had a lot of luck with http://kishkee.com. Great interface, its fast, and there’s a free plan. Thank you for the list! You should consider adding http://www.WebtoSmartphone.com to your list. It’s backed by MobileAppAmerica. It is free to try! Usual suspects! You should also try new mobile marketing platform with cool name. With http://ma.rs you can create mobile websites and do much more. There is a free plan (2 websites) also. Thanks for this post. And thank you to everyone who posted additional resources for making my site mobile-ready. I think I’m going to try a few of them and see how it goes! Excellent post, I have been looking for this stuff.You are a star! This web site is genuinely interesting. You actually provide up a few good details regarding your write-up. This is my personal newbie here inside this kind of web page therefore great work. Good tools, thanks for sharing. The problem with all these sites are they are hosted which if you want one for personal use is fine. Putting your business etc on them is like putting your main website on Google blogger. Why send another company all your traffic and visitors. Learn how to build your own mobile website that will fit on any phone and put it on your own hosting. It is very easy and you will get all the credit both personally and from the search engines. Just do a search for business mobile websites. We have newly launched a similar free service for bloggers http://www.bloapp.com It allows bloggers to convert their blogs into a native iPhone app. You can also customize the app’s look and feel.